Here is a modification from a normal focus adapter for the Sanwu BE . The host has a G Ball diode set in with a M9X0.5 lens barrel . This really forms the bar of the G Ball into a nice tight dot . I was impressed when I tested it work great and was fun to fabricate. This can be done with any custom focus adapter to accept the Sanwu BE . Some pics enjoy and thanks for looking. Yes I was pleased with the results myself, I had the tap custom made . You can not find the thread and pitch anywhere on line. Its a custom thread and the threads are smooth like butter and polished. Thanks buddy. That host looks good, nice uniform thickness, the beam expander is a perfect addition. That adapter looks real good, Rich; that Sanwu 3E BE is a nice match with that host! I've run into those 11.4mm threads on a few different Chinese products, both flashlight hosts and lasers; I don't know why they use such an oddball size. 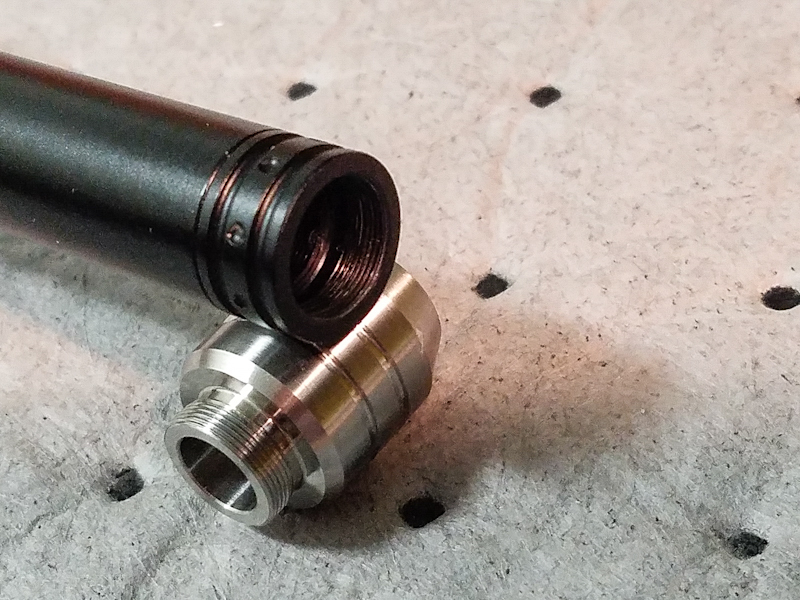 I've also recently had to make an 11.4mm threaded adapter for one of my projects, a homemade mini lightsaber attachment. If any one remembers, Jetlasers used to make small black pen laser for a very short period of time, and they happen to have that same odd thread on the ID of the front end of it, I'm not sure what the reasoning was. and no doubt expensive for onesies. yes it is an odd size and I think the reason is they would be unique and not able to duplicate with normal thread sizes available. You could offer a host width adaptor in addition to the thumb adjustor that way the adaptor won't need the M9 lens barrel seat/ridge and setting up an infinity focus will be easy, just put a screwdriver through the adaptor and hold the lens ( already focused to infinity ) in place with the screwdriver while screwing the adaptor down over the lens barrel then add the beam expander, this way the module depth will not need to be adjusted and the thumb adjuster can be switched out at will.